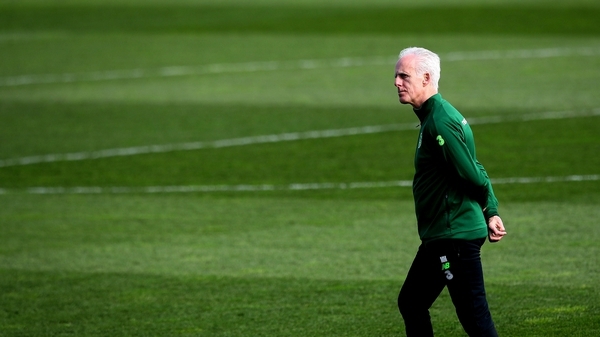 When Mick McCarthy was ran out of the Ireland job sixteen and a half years ago, he envisioned a time when he'd be walking down Barnsley, flat-capped and flanked by a Jack Russell, and a fellow dog walker would nudge his wife and say "There's the b******s who sent Roy Keane home". It hasn't quite worked out like that and on Saturday, McCarthy takes control of Ireland in a competitive fixture for the first time since 2002. The squad Mick takes to Gibraltar has been compared unfavourably to the bunch he first inherited in 1996, but there are parallels as well. The 90s is often used as a shorthand for Irish footballing glory days, but people often forget the violent transitional wobble in the middle of the decade. In 1996, as now, Mick was taking over a team whose best days appeared behind them (though the early 90s team had scaled loftier heights). Optimism was thin on the ground and there was a feeling that McCarthy was destined to preside over a difficult period for the national team. 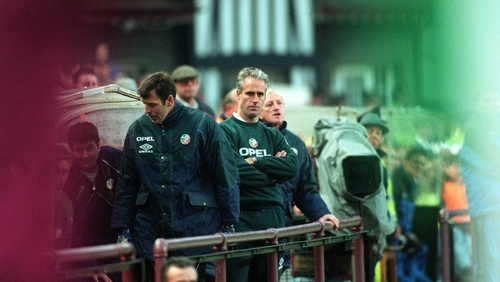 If 2018 was a dismal year for Irish football, then 1995 wasn't too hot either. Euro '96 qualification had been going swimmingly but Big Jack's magic abruptly stopped working sometime in the summer of '95 and the team's form duly collapsed. We can't fully pin the blame on the monstrous feed of fish and chips from Harry Ramsden's on the Naas Road (no longer open sadly) as that came in the wake of the goalless draw in Liechtenstein, but clearly it was symptomatic of a manager whose time had perhaps come and gone. Jack's team had hung a little on the older side for a few years but by the back end of the '95, the engine really began to splutter. From June onwards, Ireland drew with the aforementioned principality ("Ireland drew with a mountain top yesterday," was the line penned by soccer writer Peter Ball), lost home and away to Austria, stumbled to a shaky home win over Latvia, and were then blown away by Portugal in rain-soaked Lisbon. The 90s is often used as a shorthand for Irish footballing glory days but people often forget the violent transitional wobble in the middle of the decade. They arrived, coughing and wheezing, for the Anfield playoff, their aged team totally ill-equipped for the challenge of a slick Netherlands outfit, roughly half of whose players had won the Champions League with Ajax seven months earlier. Indeed, they were lucky to scrape into that Anfield game at all. Had Northern Ireland scored one more goal in their 5-3 win over Austria, they'd have made it instead. It's touch and go whether that catalogue of horrors matches up with the hopeless despair of 2018 but it reminds us that McCarthy often arrives into unpromising environments. The difference is, in 1996, Mick had eight months worth of friendlies - most of which Ireland lost - to prime and polish his team for the World Cup qualifiers later in the year. In 2019, he has little time to work with. The campaign for France '98 was a messy business, not one marked by too many montage worthy feelgood moments. Even the important victories - 4-2 away to Iceland, 2-1 away to Lithuania - were uncomfortable affairs. The side was comprised of Mick's former teammates, old stagers from the Charlton era giving it one final whirl, and a new band of untested young players still trying to establish themselves in England. It was one of the most unglamorous groups Ireland were ever landed in but they probably had reason to be grateful for it. Had the qualification draw been less kind, Ireland would probably not have made the playoff at all. Romania were streets ahead of everyone, although Ireland were unlucky to lose 1-0 in Bucharest in April '97. They won all their matches bar the final game, a virtual dead rubber in Dublin. Lithuania, who usually hover somewhere just above minnow level, here finished in third spot, only one point behind Ireland. Iceland punched above their weight, albeit not to the extent they do these days. Tiny Liechtenstein were negotiated with less difficulty this time. And Macedonia, the bane of Mick's existence, completed the group. McCarthy, in only his second job in management, was less philosophical and charming than the McCarthy we see before us in 2019. In RTÉ's behind-the-scenes documentary on the campaign, McCarthy's Park, the under-pressure manager comes off like the type of man given to compiling lists of his enemies. He's seen berating Jim Beglin prior to a live touchline interview, telling the former Ireland international that he'd "made his bed" and that he was only speaking to him so he could address "the people at home." Players were alienated. John Aldridge took umbrage at being placed on the fringes and retired in a huff. Paul McGrath's Ireland career ended in confusing circumstances, with McCarthy insisting he was too injured to play in Macedonia. In McCarthy's Park, the manager disclosed that a few of the older players had bothered him with complaints of the 'But Jack used to do it this way' variety. One of the major changes was the style of play. Ireland, with an allegedly inferior band of players coming on stream, were to play a more ambitious brand of football. It is still strange to think that McCarthy, often portrayed as Jack's most slavish lieutenant, a man who was thought to owe most of his caps to the Geordie's no-nonsense preferences, was the guy to wean Ireland away from the kick and rush style - before other managers weaned them back onto it. It was a campaign fairly well stocked with lowlights. The 0-0 draw at home to Iceland in late 1996 wasn't much fun. That was the day Roy Keane was booed throughout by his own fans, supposedly on the urging of journalists annoyed by his a la carte attitude towards friendlies. RTÉ Sport's Tony O'Donoghue, then writing in the Cork Examiner, called the booing the "saddest sound in Irish sport." "I told my journalistic colleagues before the game that if Keane got a hostile reception they should bear much of the responsibility for that and at least have the decency to be ashamed," O'Donoghue wrote. "It was no less shocking when he was booed. It was the saddest sound in Irish sport. "Keane was the best player by a country mile during a depressing 90 minutes for Irish football against Iceland. That 0-0 draw could yet do us untold damage and hinder our World Cup qualification hopes." Unfortunately, it wasn't the most infamous game in the campaign, not by a long stretch. That dishonour goes to the 3-2 defeat to Macedonia, billed at the time as the worst result in yonks, though the 2006 loss in Cyprus made it look positively respectable. Ireland, in their collectors' item orange strip, went ahead early through Alan McLoughlin and then proceeded to implode over the next hour. Two penalties given away by Jason McAteer and Terry Phelan made it 2-1 at half-time and then Georgi Hristov deepened Irish misery just before the hour mark by thwacking a shot in off the crossbar. Substitute David Kelly pulled one back on 78 minutes but the desperate visitors couldn't rustle up an equaliser. Shelbourne's Stephen Geoghegan, the first LOI man drafted in for a few years, might have been thrown into the mix but for the fact he missed out on the matchday squad, the injury-threatened Keith O'Neill selected ahead of him on the bench. An ignominious defeat staring them in the face, Ireland's discipline began to dessert them. Or at least Jason McAteer's did at any rate. Near the end, the Liverpool winger pitched his entry for inclusion in future YouTube compilations of outrageous fouls when he almost decapitated a Macedonian player with a terrifying flying kick. The Macedonian full back was so outraged by the foul, he had to be restrained from lunging at McAteer by teammates. McCarthy was an isolated figure at that stage and the result hit him hard. "I thought I'd been hit with a baseball on the back of the head. I guess I wanted a row with someone really. I don't know who was going to be the unlucky recipient of the row," the manager told the McCarthy's Park documentary. By the end of August 1997, it was looking dicey whether Ireland would even make the playoff. A dismal scoreless draw at home to Lithuania left them in third spot, two points behind Macedonia, and only ahead of the Lithuanians on goal difference. However, they roused themselves that autumn. Things looked ominous when they went 2-1 down after half-time in Iceland but a few scratchy goals from Roy Keane (2) and Mark Kennedy gave them a vital victory. In a campaign in which David Connolly, Keith O'Neill and others were given their start, it was grey-haired old timer Tony Cascarino, pushing 35 and then playing with Nancy, who found a burst of goalscoring form. He scored twice against Macedonia in the 3-0 win early in the campaign and then, far more importantly, headed home both goals in the crucial 2-1 victory over Lithuania in the penultimate game in Vilnius. That win ensured Ireland's place in the playoffs and provided the campaign with its greatest moment of jubilation. A battling 2-1 win away in Lithuania. It was that sort of campaign. The Belgian test in the playoffs would prove a bridge too far for McCarthy's work-in-progress outfit, though they gave it a reasonable rattle in the circumstances. A reasonable rattle in the circumstances is probably a fair summation of the entire campaign. In 2019, McCarthy, with a more daunting qualifying group and with less friendly games in which to work out the kinks, can't afford the same teething problems. On the plus side, the manager arrives for his second stint wiser, more relaxed figure with a decade and a half of solid achievement in English club football under his belt. A better manager than he was in 1996.